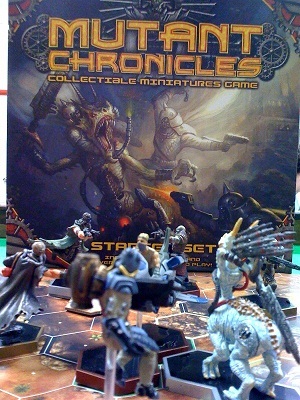 In Mutant Chronicles, each player constructs an army of units, order tokens and special cards. These are all marked as Gold, Silver, or Bronze and the players are allowed to use a certain number of each rating. Once they have constructed their armies, they place them on the game board. Each round consists of the players taking turns back and forth by placing two order markers on their unused figures until they run out of figures or orders. Depending on the rank of the order used (Gold, Silver or Bronze), the player can take up to 3 actions with their figure. The actions can consist of moving, attacking, taking a special action or guarding (but they can only perform each action once). To attack, they must have a clear line of sight, and then roll special attack dice to determine accuracy and hits. Going "on guard" allows the figure to attack one enemy unit when it moves (assuming that your unit has clear line of sight), and moving and special actions should be self-explanatory. Rounds go on until one of the players reaches a certain number of victory points - by destroying figures or by controlling victory point locations (or a combination). Once the pre-defined number of points has been reached, the game is over. The main thing that I liked about Mutant Chronicles was how they broke down the dice (and determined accuracy). Each unit got a certain number of dice when attacking (for example 2 green dice). The different dice represented the different kinds of attacks: green for example, was light, long range fire. After the dice were rolled, you used the highest number on any of the rolled dice to determine the accuracy of the attack; if you rolled an 8 and were within 8 hexes of your target, then you scored hits with all of the damage icons that were rolled. If your accuracy was less than your distance, then you missed. The next pro that Mutant Chronicles had was how the orders worked. First, I thought it was interesting that when building armies your order markers were factored in. Secondly, which order to use and when you used it was important in the game. You wanted to make sure you got the most "bang for your buck" with your gold orders, since they both give you the most actions and cost an important spot when building your army. The orders also were able to do some other interesting things like buying back your special action cards. Overall, I think the interplay of the orders with the units and cards would allow for some very interesting army building strategies. The final pro of Mutant Chronicles was the production quality of the figures. The figures (as seen in my poorly taken photo at the top) are top notch. I don't know that I've played another game with such high quality figures. However, this leads directly into the reason that the game died: it was overpriced in my opinion. I paid nothing for my set, and so I feel that I got a bargain, but the list price of the game was about $15-$20 for a booster that contained 2-3 figures. The pricing was closer to Warhammer , but I think that the target audience was more like the people that play Heroscape (in which you got twice as many figures for quite a bit cheaper). This factor doesn't really affect the gameplay, so it doesn't affect it's score in my opinion. I just thought it was worth noting. Now for the actual cons. First, though the figures production value was incredibly high, the map was pitiful. It was a fold-out piece of paper (not even cardstock). In addition, the map was incredibly cluttered and thus it was very hard to see what was going on. I think that if I were to play this game more often, I'd at least attempt to use my Heroscape terrain as I think that it might work (I haven't really checked the scale - I know that the Mutant Chronicles figures are quite a bit bigger, but I think the size of the terrain on their map is comparable to the size of the Heroscape terrain.) As it was, there was only one map included with the game, so there was no versatility and no way (out of the box) to change the fact that I didn't like the default map. The next con of the game was the unbalance between the different factions. This part may be a figment of my imagination, but since I'm the one writing the reviews I get to pretend that it's factual. All of the humans that I looked at except for 1-2 seemed to be long range sniper figures with very few hitpoints whereas the demons all seemed to be close range heavy hitters with lots of hitpoints. This is normally a decent balance, but ideally you want to build armies that include both types. This may be because the game went away so quickly, but there didn't appear to be enough diversity to do this. Also, when using the default map, there was too much clutter to actually get long range shots off on your opponents and thus the humans are reduced to running to claim Victory Locations and hope that they can take down a few demons before they get slaughtered. Overall, I give Mutant Chronicles a 7.0/10. The gameplay was not too bad, and the figures were incredibly nice, but the game didn't seem to live long enough to mature into a title that would keep my attention for longer.